The Assyrian Virgin Mary Church in Tel Nasri, Syria, was destroyed by ISIS on Easter Sunday. 5. Inspiration for Today: No Limits To What God Can Do! There is something liturgical about the way today's Gospel scenes unfold. It's as if John is trying to show us how the risen Lord comes to us in the liturgy and sacraments. Nearly everyone on occasion experiences a throbbing headache that interferes with concentration at work or school, or saps the joy from the day. If you've ever had to struggle to choose between Peanut Butter and Chocolate Chip for your cookies, the two homemade goodies, you will be supremely grateful for this recipe. Speaking generally, men tend to ignore problems in their marriage while women, being more relationally oriented, feel the various highs and lows of the relationship. Women tend to read books on relationship, watch television shows pertaining to relationships and seek counseling to improve those relationships. "Rarely since the first century has the church in the East faced persecution on this scale. Christian communities that took 2,000 years to build, and that were started by the apostles themselves, lie in ashes between the Tigris and the Euphrates." There is truly something special about our Good Friday and Easter Services. For one thing, the Kanji (rice soup) tastes special after spending the whole day meditating in the church and going through and experiencing the Passion of Jesus underwent on Good Friday. Songs are nice; because everyone has a chance to participate in singing them (especially the melodical poems written by St. Ephraim). But I am not sure anyone pay any attention to what they are singing. May be it is time to bring some more prose into the Good Friday services, so that we can contemplate what it represents. The Sedra prayers - the long prayer by the priest after the Promeon - are truly special on Good Friday. If we pay attention, we can really get a good idea what is special about Good Friday and ties the experiences of Jesus all the way back to the Old Testament and the experience of Adam and Eve in Aden, the theology behind the Passion. After all, the purpose of Jesus' visit to earth was to redeem us from the fall as a result of the original sin. The resurrection is the most important event for Christians, as I mentioned in the last issue of MWJ. Christ dying on the cross, and then rising on the third day after conquering the death was how the redemption plan was planned by God. Without resurrection, there is no Christianity. That is why we have "empty" cross unlike the Catholic Church who has the crucifix. We emphasize a resurrected savior not a crucified savior. Our Lord's Cross is the gateway into His life. His resurrection means that He has the power to convey His life to me. When I was baptized, I received the very life of the risen Lord from Jesus Himself. Christ's resurrection destiny - His foreordained purpose - was to bring "many sons to glory" (Hebrews 2:10). The fulfilling of His destiny gives Him the right to make us sons and daughters of God. We never have exactly the same relationship to God that the Son of God has, but we are brought by the Son into the relation of son-ship. When our Lord rose from the dead, He rose to an absolutely new life - a life He had never lived before He was God Incarnate. He rose to a life that had never been before. And what His resurrection means for us is that we are raised to His risen life, not to our old life. One day we will have a body like His glorious body, but we can know here and now the power and effectiveness of His resurrection and can "walk in newness of life" (Romans 6:4). Paul's determined purpose was to "know Him and the power of His resurrection" (Philippians 3:10). Jesus prayed, ". . . as You have given Him authority over all flesh that He should give eternal life to as many as You have given Him" (John 17:2 . The term Holy Spirit is actually another name for the experience of eternal life working in human beings here and now. The Holy Spirit is the deity of God who continues to apply the power of the atonement by the Cross of Christ to our lives. Thank God for the glorious and majestic truth that His Spirit can work the very nature of Jesus into us, if we will only obey Him. Inspiration for Today: No Limits To What God Can Do! One of God's biggest frustrations must be how lightly some of us interpret the Bible, thinking of His Word as merely a storybook filled with moral lessons to follow and teach our kids. Obey your parents. Do unto others. Turn the other cheek. The Bible, however, is filled with stories of how God, through one person, made the impossible happen. And He wants to do the same thing through us. It's time for us to live out our lives like we believe God's Word with all our heart, soul, and mind. We must study and apply His promises every day. We must use the Bible as a guide to living the abundant life He has intended for us. God may not duplicate the same biblical miracles we read about, but He can and does perform new ones. I believe there is no limit to what God will do to save His children. There is no prayer so great that He cannot answer it. There is no injustice so overpowering that He cannot put it right. God can bring healing to our souls and our bodies. In today's Gospel we see that the Risen Lord appeared to the apostles who were gathered together in one place. The fact that they were gathered in one place is not without significance, for it is there that the Lord appears to them. One of them, as we shall see, was not in the gathering and this missed the blessing of seeing and experiencing the risen Lord. It might be said that Thomas, the absent disciple, blocked his blessing. Some people want Jesus without the Church. No can do. Jesus is found in his Church, among those who have gathered. There is surely a joy in a personal relationship with Jesus, but the Lord also announced a special presence whenever two or three are gathered in his name (cf Mat 18:20). It is essential for us to discover how Mass attendance, and walking in fellowship with the Church, is essential for us if we want to experience the healing and blessing of the Lord. This Gospel has a lot to say to us about the need for us to gather together find the Lord's blessing in the community of the Church, in his Word and the Sacraments. Lets look at the gospel in five stages. Notice how the text describes the apostles gathering: On the evening of that first day of the week, when the doors were locked, where the disciples were, for fear of the Jews..… These men are frightened, but they are in the right place. It is Sunday, the first day of the week, and they have gathered together. The text says nothing of what they are doing, other than that they have gathered. But in a sense, this is all we need to know, for this will set the stage for blessings and for the presence of the Lord. And these are men who need a blessing. The locked doors signify their fear of the Jewish authorities. One may also presume that they are discouraged, lacking in hope, even angry. For they have experienced the earthquake that Jesus' crucifixion was for them. It is true that some of the women in their midst claimed to have seen him alive. But now it is night and there have been no other sightings of which they have heard. But, thanks be to God, they have gathered. It is not uncommon for those who have "stuff" going on in their lives to retreat, withdraw, even hide. Of course this is probably the worse thing to do. And it would seem that Thomas may have taken this approach, though is absence is not explained. Their gathering, as we shall see, is an essential part of the solution for all that afflicts them. This gathering is the place in which their new hope, new heart and mind will dawn. And for us too, afflicted in many ways, troubled at times, and joyful at others, there is the critical importance of gathering each Sunday, each first day of the week. Here too for us in every Mass, is the place where the Lord prepares blessings for us. I am powerfully aware at how every Mass I celebrate, especially Sunday Mass, is a source of powerful blessings for me. Not only does God instruct me with his Word, and feed me with his Body and Blood, but he also helps form me through the presence and praise of others, the people I have been privileged to serve. I don't know where I'd be if it were not for the string and steady support of the People of God, their prayers, their praise, their witness and encouragement. So here they are, meeting together, encouraging one another. As we shall see, the Apostles are about to be blessed. But the blessing occurs only the context of the gathering. Thomas, one of the apostles, is missing, and thus he will miss the blessing. This blessing is only for those who are there. And so it is for us who have also have blessings waiting, but only if we are present, gathered for holy Mass. Don't block your blessings! And sure enough here comes the blessing, For where two or three are gathered in my name, there am I among them (Matt 18:20). The text from today's Gospel says, Jesus came and stood in their midst and said to them, "Peace be with you." When he had said this, he showed them his hands and his side. The disciples rejoiced when they saw the Lord. Jesus said to them again, "Peace be with you. Suddenly there is a completely new reality, a new hope, a new vision. Note too, there is also a new serenity, a peace, a shalom. For not only do they see and come to experience a wholly new reality, but they also receive an inner peace. Observe again, this is only to those who are present. And here is a basic purpose of walking in Fellowship with the Church and of the gathering we call the sacred liturgy. For it is here that we are invited to encounter the Living Lord, who ministers to us and offers us peace. Through his word, we are increasingly enabled to see things in a wholly new way, a way which gives us hope, clarity and confidence. Our lives are reordered. Inwardly too, a greater peace is meant to come upon us in an increasing way as the truth of this newer vision begins to transform us, giving us a new mind and heart. And, looking to the altar we draw confidence that the Lord has prepared a table for me in the sight of my enemies and my cup is overflowing (Ps 23). The Eucharist is thus the sign of our victory and election and, as we receive the Body and the Blood of the Lord we are gradually transformed into the very likeness of Christ. Is this your experience of the gathering we call the Mass? Is it a transformative reality, or just a tedious ritual? As for me, I can say that I am being changed, transformed into a new man, into Christ, by this weekly, indeed, daily gathering we call the Mass. I have seen my mind and heart changed, and renewed. I see things more clearly, have greater hope, joy and serenity. I cannot imagine what my life would be like, were it not for this gathering of the Holy Sacrifice of the Mass where Jesus is present to me and says, "Shalom, peace be with you." Over the years, I am a changed man. Yes, the Mass works, it transforms, gives a new mind and heart. Don't bloc your blessings, be there every Sunday. Next comes something quite extraordinary that also underscores the necessity of gathering and simply cannot take place in a privatistic notion of faith. The text says, As the Father has sent me, so I send you." And when he had said this, he breathed on them and said to them, "Receive the Holy Spirit. Whose sins you forgive are forgiven them, and whose sins you retain are retained." In this remarkable moment, the Lord gives the apostles the power to forgive sin. Note that he is not simply giving the ability to announce that we are forgiven. He is giving them a juridical power to forgive, or in certain cases, to withhold or delay forgiveness. This is extraordinary. Not only has he given this authority to men (cf Matt 9:8), but he has also given it to men, all of whom but one, had abandoned him at his crucifixion. These are men well aware of their shortcomings! Perhaps only with this awareness can he truly trust them with such power. Here is the heart of Divine Mercy Sunday: the Lord's mercy for us, and that mercy available to us through his presence on earth, his mystical Body, the Church. 1. Also many of those who were now believers came, confessing and divulging their practices. (Acts 19:18). 2. Is any one of you sick? He should call the presbyters of the church to pray over him and anoint him with oil in the name of the Lord. And the prayer offered in faith will make the sick person well; the Lord will raise him up. If he has sinned, he will be forgiven. Therefore confess your sins to one another and pray for each other so that you may be healed. The prayer of a righteous man is powerful and effective. (James 5:14-16). Many consider it sufficient merely to speak to God privately about their sins. But the Scriptures once again instruct us away from a solitary notion and bid us to approach the Church. The Lord gives the apostles authority to adjudicate and then absolve or retain sin, but this presupposes that someone has first approach them interpersonally. Paul too was approached by the believers in Ephesus who made open declaration of their sins. The Book of James also places the forgiveness of sins in the context of the calling of the presbyters, the priests of the Church and sees this as the fulfillment of "declare your sins to one another…the prayer of the righteous man has great power." We have already noted that Thomas blocked his blessing by not being present. The text says, Thomas, called Didymus, one of the Twelve, was not with them when Jesus came. So the other disciples said to him, "We have seen the Lord." But he said to them, "Unless I see the mark of the nails in his hands and put my finger into the nail marks and put my hand into his side, I will not believe." Thomas exhibits faltering fellowship in two ways. First he is not with the other apostles on resurrection evening. Thus he misses the blessing of seeing and experiencing the resurrection and the Lord. Secondly, Thomas exhibits faltering fellowship by refusing to believe the testimony of the Church that the Lord had risen. One of the most problematic aspects of many people's faith is that they do not understand that the Church is an object of faith. In the Creed every Sunday, we profess to believe in God the Father, and to believe in Jesus Christ, his only Son, our Lord, and to believe in the Holy Spirit, the Lord and giver of life. But we are not done yet. We go on to say that we believe in one, holy, catholic and apostolic Church. We know and believe what we do about Jesus Christ on the basis of what the Church hands on from the apostles. Some say, "No, I believe in what the Bible says." But the Bible is a Book of the Church. God has given it to us through the Church who, by God's grace, collected and compiled its contents and vouches for the veracity of the Scriptures. Without the Church there would be no Bible. So in rejecting the testimony of the Church, Thomas is breaking fellowship and refusing to believe in what the Church, established by Christ to speak in his name (e.g. Lk 24:48; Lk 10:16; Matt 18:17; Jn 14:26; 1 Tim 3:15; inter al.). And so do we falter in our fellowship with the Church if we refuse to believe the testimony of the Church in matters of faith and morals. Here too is a privatization of faith, a rejection of fellowship, and a refusal to gather with the Church and accept what she proclaims through her Scriptures, Tradition, and the catechism. But note, as long as Thomas is not present, he has blocked his blessings. He must return to gather with the others in order to overcome his struggle with the faith. Thomas returns to fellowship with the other Apostles. As we do not know the reason for his absence, his return is also unexplained. Some may want to simply chalk up his absence to some insignificant factor such as merely being busy, or in ill health or some other possible and largely neutral factor. But John seldom gives us details for neutral reasons. Further, Thomas DOES refuse to believe the testimony of the others, which is not a neutral fact. But praise God, he is now back with the others and now in the proper place for a blessing. Whatever his struggle with the faith, he has chosen to work it out in the context of fellowship with the Church. He has gathered with the others. And now comes the blessing. You know the story, but the point here for us is that whatever our doubts and difficulties with the faith, we need to keep gathering with the Church. In some ways faith is like a stained glass window that is only best appreciated when one goes inside the Church. Outside, there may seem very little about it that is beautiful. It may even look dirty and leaden. But once inside and adjusted to the light the window radiates beauty. It is often this way with the faith. I have personally found that some of the more difficult teachings of the Church could only be best appreciated by me after years of fellowship and instruction by the Church in both here liturgy and in other ways. As my fellowship and communion have grown more intense, so has my faith become clearer and more firm. Thomas, now that he is inside the room sees the Lord. Outside he did not see and doubted. The eyes of our faith see far more than our fleshly eyes. But in order to see and experience our blessings, we must gather, must be in the Church. Finally, it is a provocative but essential truth that Christ is found in the Church. Some want Christ without the Church. No can do. He is found in the gathering of the Church, the ekklesia, the assembly of those called out. Whatever aspects of his presence are found outside are but mere glimpses, shadows emanating from the Church. He must be sought where he is found, among sinners in his Church. The Church is his Body, and his Bride. Here he is found. That his presence may be "felt" alone on some mountaintop can never be compared to the words of the priest, "Behold the Lamb of God." Thomas found him, but only when he gathered with the others. It is Christ's will to gather us and unite us (Jn 17:21). Congregavit nos in unum Christi amor (the love of Christ has gathered us in one). Three times in Psalm 118 we cry out a victory shout: "His mercy endures forever." Truly we've known the everlasting love of God, who has come to us as our Savior. By the blood and water that flowed from Jesus' pierced side (see John 19:34), we've been made God's children, as we hear in Epistles. Yet we never met Jesus, never heard Him teach, never saw Him raised from the dead. His saving Word came to us in the Church - through the ministry of the apostles, who in today's Gospel are sent as He was sent. He was made a life-giving Spirit (see 1 Corinthians 15:45) and He filled His apostles with that Spirit. They bore witness to His resurrection with great power. And through their witness, handed down in the Church through the centuries, their teaching and traditions have reached us (see Acts 2:42). We encounter Him as the apostles did - in the breaking of the bread on the Lord's day (see Acts 20:7; 1 Corinthians 16:2; Revelation 1:10). In both scenes it is Sunday night. The doors are bolted tight, yet Jesus mysteriously comes. He greets them with an expression, "Peace be with you," used elsewhere by divine messengers (see Daniel 10:19; Judges 6:23). He shows them signs of His real bodily presence. And on both nights the disciples respond by joyfully receiving Jesus as their "Lord." Isn't this what happens in the Mass - where our Lord speaks to us in His Word, and gives himself to us in the sacrament of His body and blood? Let us approach the altar with joy, knowing that every Eucharist is the day the Lord has made - when the victory of Easter is again made wonderful in our eyes. I didn't get up in time to go to my weight training class this morning. It's the day after Easter, after all, and my 4:45 alarm just came too early. So instead I decided to take the walk I've been fitting in these last couple of weeks. It takes just more than half an hour to make the circle and while it's not my usual summer walk it's been just right on these mornings when spring is making a late start. I altered my route by a block or so though today as I remembered that even as cold as it has been, the crocuses must be up by now. For you see, there's a house about a block from where I live where the crocuses bloom every spring. They're not in an actual garden set apart. Rather, the green shoots and the bright white blossoms poke their way through the grass all over the front lawn. I remember what a precious surprise it was the first time I happened upon them. Now I go looking for them early in the spring. I go because I've seen them before. I go because even when there there is no other evidence of life just yet, I know they'll come again. They always do. It was as I made my way down the street towards those promised crocuses that I came upon another surprise this time. Yesterday was Easter after all and apparently some youngsters had gotten sidewalk chalk in their Easter Baskets this year and so for anyone passing by we were treated with a whole length of sidewalk drawings. First there was a hopscotch pattern traced in purple chalk. And then there was in large capital letters HAPPY EASTER!!! for all to see. And then there was another hopscotch game sketched out this time in bright orange chalk. By then I couldn't resist. I glanced over my shoulder to be sure no one else was out and about and I skipped my way through the last several squares. I found, I wondered though, as I continued on my walk about, how those children learned about hopscotch. In this age of smart phone apps and video games and mostly organized sports, somehow children still learn to draw hopscotch on the sidewalk and to jump through the squares. Someone must have taught them. Someone must have passed along the joy we can know in such a simple game. For it is so that we meet up with Thomas once more. And I have to say that yet again this year I find myself empathizing with his unwillingness to embrace the news of Jesus' resurrection until he had seen the evidence. I am certain I am no different from him. If I hadn't seen those crocuses every spring for the last five years I surely would not have gone looking for them today. And that is only spring flowers. Anyone who has experienced the cycle of the seasons even just a few times knows to look for flowers which will come again. But in the case of Jesus' being alive again? What in all of his life experience could have prepared Thomas for that? Except, of course the stories of such remarkable things which had happened over and over before throughout the history of God's people. Indeed, as I experienced our Easter Vigil service on Saturday night I found myself leaning back into my pew and settling into the long familiar ancient stories once more. The Story of Creation. Of Noah and the Flood. Of the Parting of the Red Sea. Of the Valley of Dry Bones Coming to Life Again. I have never seen these things, just as Thomas had not seen these things. It may be a stretch, but it reminds me of all children in all times and places to whom gifts are passed along: in small things like learning to draw and play hopscotch and in large things, too, like stories of a people and our God and what it is to live as those who know that death did not defeat Jesus and so does not stand a chance with us either. In part we know this is so because we have been told that God has been doing the unexpected, the impossible, the life altering, death defeating for all of time. To be sure, Thomas had also heard all the stories from his youth. One wonders why the rumor that Jesus, too, was alive again would come as a surprise. It could be that Thomas was blinded by grief, by long learned cynicism, by exhaustion, by fear... But even if that wasn't the case, I suppose one can't really blame him for asking for the evidence. The other disciples had had as much as he asked for before they believed. They had seen the Risen Christ. Thomas only demanded the same. And maybe, just maybe, his knowing the ancient stories enabled him to finally fully believe after all. For you'll notice that for all of his insistence, he never did place his finger into the mark of the nails or his hand into Jesus' side and yet he still believed. How have you come to embrace a belief in the Risen Christ? Do you relate to Thomas' struggle to believe? Why or why not? What difference does it make to you that the ancient stories have been passed on to you as well? How do they shape your understanding of how God works in the world still? How did the promise of Easter come home for you this year? Sometimes I think we have more faith in our fears than we do in God. Have you ever been locked in by your fears? Just before this scene from John's gospel, we learn that, on this same day, just as dark was turning to dawn, Mary Magdalene came to the tomb and saw that the stone had been rolled away (Jn 20:1). Later that morning she stands weeping in the Garden locked in her grief, unable to see Jesus. She is unable to see him for two reasons: One is that tears blurred her vision. The second is that she never expected to see him again. She runs to tell the disciples the good news, "I have seen the Lord!" Their response: to huddle behind locked doors as evening falls. I'm not judging them. They had a lot to be afraid of. They could be accused of stealing his body. They could be punished for guilt by association with his movement. It's a dark world out there. Who are we to blame them for locking themselves in? Have you ever met anyone who is locked in? Gordon Lathrop, Lutheran liturgical scholar, once said, "You don't have to knock very hard on any door in your parish to find some sort of agony behind that door." Knock on one in four doors and you'll find a woman who is being or has been abused, most often by an intimate partner. And you'll find little boys with big eyes watching what Daddy is doing to Mommy, being homeschooled to be future abusers. Boys who observe their mothers being abused are twice as likely to grow up to abuse their partners. "It doesn't happen that often. I know he loves me. I'm afraid of what he would do to the kids if I left. I have no skills or friends. Everything is in his name. I have nowhere to go," you'll hear the women say. Have you ever been locked in? Do you know anyone else who has been? Fear is a physiological response to tomorrow. It is almost always about death. Fear causes us to live in a perpetual state of anxiety. Fear is exhausting and depressing. Generally, the calamities I expect do not come to pass. So I replace them with new ones. Time and energy that could be used constructively, for prayer, dishwashing, learning to quilt, I sacrifice to cultivate apprehension (The Christian Century, "High Anxiety: The Terror of the Dark Unknown," March 7, 2012; partial paraphrase). Sometimes I think we have more faith in our fears than we do in God, in the Risen Christ. Have you ever been locked in by your fears? Of course, when someone or something is locked in, someone else has to be locked out. That summer long ago I was serving as the summer Duke University intern in the little town of Aberdeen, North Carolina. I had not yet been to seminary. I had not yet had a preaching class. Yet there I was. My senior pastor assigned me my first sermon. I don't even remember the text. I typed up my sermon, which was basically a little lecture on all I had learned from the commentaries, placed it on the front seat of my 1972 Dodge Dart, and drove from Miss Mary Hoopert's house (where I was staying) to the church. I had told my parents in Pennsylvania I was preaching my first sermon. Unfortunately they had spilled the beans to the extended family that lived in North Carolina. So as I pulled up, I saw, with horror, another car pull up beside me. It was filled with my three North Carolina uncles (Uncle Jim, Uncle Bill, and Uncle Horace and their wives Aunt Lucy, Aunt Catherine, and Aunt Louise). As they waved cheerily at me, I got out of the car and locked my keys and sermon manuscript inside. Have you ever been locked out? I still remember that helpless feeling of being locked out. Locked out is how we feel when a child is trapped in an addiction or job situation and you can't break through to make it all better, to make them want help. Locked out is how we feel when someone we care about is filled with guilt and self-loathing. We keep assuring them they are forgiven, but they just aren't buying the fact that this good news is for them. Locked out is how we feel when we read poverty statistics and wonder how things will ever change if we continue with politics as usual. Locked out is how those being discriminated against feel when they look at the worlds that are open to those who aren't. Have you or anyone you know ever been locked out? Apparently Jesus hasn't. There are no walls thick enough to block the entry of the Risen Christ into the inner sanctum, the safe room the disciples had created at the center of their fears. But he is no apparition who pops in for a visit to wish the disciples well. He had a spiritual body, as Paul calls it in 1 Corinthians 15:44. He has a transformed body, as Paul calls it in 1 Corinthians 15:51. This body is not purely spiritual or physical, but is a unique sort of personal identity (Kysar, 159). The resurrected Christ who passes through locked doors is the same one who then shows the disciples his hands and his side (20:20). He has a body, and he has come into our locked rooms, not just to visit, but bearing gifts that can heal a hurting, hostile world. The first gift Jesus offers is peace. He has promised in 14:27 to give his followers peace, and now, as the Risen Lord, he does so. Three times in this passage he says, "Peace be with you." It is at the same time both an ordinary greeting and an extraordinary greeting. The number three is a familiar number in the gospels. Jesus undergoes three temptations by Satan. Jesus prays three times in Gethsemane that "this cup pass from me" in Mark's version. Peter denies Jesus three times. Then at the end of John's gospel, Jesus asks him three times if he loves him and he offers Peter forgiveness. The resurrected Jesus, who can pass through locked doors, offers the blessing/greeting "Peace be with you" three times. Christ's peace is not a passive contentment. He gives the disciples a second gift, a mission. Believers now becomes apostles (apostoloi) because Christ sends (apostello) them into the world. God's sending Christ is the pattern for Christ's sending the disciples. They are sent out of God's love for the world and for the world's redemption (Kysar, 159). The third gift Jesus gives us is power. John's Pentecost involves no rowdy crowd and no tongues of fire. John's Pentecost is just a resurrected savior with a spiritual body who can pass through walls breathing the Spirit into our tired, fearful bodies. "He breathed on them and said to them, 'Receive the Holy Spirit'" (Jn 20:23). When does Jesus come with this peace, purpose and power? When people are locked in grief - like Mary; locked in fear - like the disciples; and locked in darkness—like the world. Knock on any door in your community, says Gordon Lathrop, and you'll find some kind of agony. We are called to leave the rooms we've locked ourselves in and go out—emboldened by the knowledge that we bear the peace, purpose, and power of one who bears the scars of his own pain, and can pass through any walls that lock us in or out. Robert Kysar, Preaching John (Minneapolis: Fortress Press, 2002). Alyce M. McKenzie is the George W. and Nell Ayers Le Van Professor of Preaching and Worship at Perkins School of Theology, Southern Methodist University. McKenzie's column, "Edgy Exegesis," is published every Monday on the Preachers Portal. Subscribe via email or RSS. Imagination was not Thomas's long suit. He called a spade a spade. He was a realist. He didn't believe in fairy tales, and if anything else came up that he didn't believe in or couldn't understand, his questions could be pretty direct. There was the last time he and the others had supper with Jesus, for instance. Jesus was talking about dying, and he said he would be leaving them soon, but it wouldn't be forever. He said he'd get things ready for them as soon as he got where he was going, and when their time finally came too, they'd all be together again. They knew the way he was going, he said, and some day they'd be there with him themselves. Nobody else breathed a word, but Thomas couldn't hold back. When you got right down to it, he said, he personally had no idea where Jesus was going, and he didn't know the way to get there either. "I am the way," was what Jesus said to him (John 14:6), and although Thomas let it go at that, you can't help feeling that he found the answer less than satisfactory. Jesus wasn't a way, he was a man, and it was too bad he so often insisted on talking in riddles. Then in the next few days all the things that everybody could see were going to happen happened, and Jesus was dead just as he'd said he'd be. That much Thomas was sure of. He'd been on hand himself. There was no doubt about it. And then the thing that nobody had ever been quite able to believe would happen happened too. Thomas wasn't around at the time, but all the rest of them were. They were sitting crowded together in a room with the door locked and the shades drawn, scared sick they'd be the ones to get it next, when suddenly Jesus came in. He wasn't a ghost you could see the wallpaper through, and he wasn't just a figment of their imagination because they were all too busy imagining the horrors that were all too likely in store for themselves to imagine anything much about anybody else. He said shalom and then showed them enough of where the Romans had let him have it to convince them he was as real as they were if not more so. He breathed the Holy Spirit on them and gave them a few instructions to go with it, and then left. Nobody says where Thomas was at the time. One good thing about not having too much of an imagination is that you're not apt to work yourself up into quite as much of a panic as Thomas's friends had, for example, and maybe he'd gone out for a cup of coffee or just to sit in the park for a while and watch the pigeons. Anyway, when he finally returned and they told him what had happened, his reaction was just about what they might have expected. He said that unless Jesus came back again so he could not only see the nail marks for himself but actually touch them, he was afraid that, much as he hated to say so, he simply couldn't believe that what they had seen was anything more than the product of wishful thinking or an optical illusion of an unusually vivid kind. Eight days later, when Jesus did come back, Thomas was there and got his wish. Jesus let him see him and hear him and touch him, and not even Thomas could hold out against evidence like that. He had no questions left to ask and not enough energy left to ask them with even if he'd had a couple. All he could say was, "My Lord and my God!" (John 20:28), and Jesus seemed to consider that under the circumstances that was enough. Then Jesus asked a question of his own. "Have you believed because you have seen me?" he said and then added, addressing himself to all the generations that have come since, "Blessed are those who have not seen and yet believe" (John 20:29). But sometimes the source of that headache can be surprising. For many people, the pain that emanates from the head can be traced back to their teeth, their bite relationship and the alignment of the lower jaw. "Pain doesn't happen randomly or because of bad luck," says Dr. Fred Abeles, author of the book "Break Away: The New Method for Treating Chronic Headaches, Migraines and TMJ Without Medication". "There's a cause and effect to almost everything in the human body." With many headaches, Abeles says, the cause is the temporomandibular joint, or TMJ, the place at the front of the ear where the lower jaw and the temporal bone on the side of the head meet. Sometimes the bite and the lower jaw are out of alignment, putting additional strain on muscles, which leads to the headaches. And for many, TMJ headaches aren't going away because people try to mask the pain with medication rather than correct the underlying cause, Abeles says. But how do you know a headache is caused by TMJ? Abeles says these are some of the warning signs. • Your jaw clicks or pops. Any joint in your body should work silently and seamlessly, Abeles says. If your jaw clicks or pops when you open or close it, it's a clear sign that the lower half of the joint is not in the proper position. Even if the popping and clicking don't produce pain, he says, the muscles that have to support and stabilize the joint become fatigued and will produce pain. • Your bite feels off. The TMJ is the only joint in the human body that has 28 teeth stuck between the opening and closing motion of the joint to complicate things, Abeles says. Every other joint is completely controlled by muscles, and the position of the joint, its movement and range of motion are mediated by muscle. The TMJ's position is dictated by where our teeth come together in our bite. So if your bite feels off or your teeth don't fit together well, there's a good chance your TMJ joints are off, too. • You have pain around your forehead, temples, back of head or radiating down your neck. Ninety percent of pain comes from muscle, Abeles says. If your muscles are not functioning well because of fatigue from supporting one or both of your TMJ joints in an improper position, they produce pain. It's much like when you exercise or work hard and feel muscle pain later, he says. The only difference is that TMJ is more subtle and chronic. • You have forward head posture. Our heads are supposed to be centered over our shoulders. If yours is in front of your shoulders when you are upright, you have "forward head posture." That relates to your bite and your airway. The human head weighs about eight to 10 pounds. The farther forward it is off the center axis, the more strain it places on neck muscles and vertebrae. • You snore. Snoring is a red flag that respiration during sleep is disturbed, Abeles says. Several factors can lead to snoring, but one of the most important is the position of the lower jaw, he says. If your lower jaw is a little too far back, then the tongue is farther back as well. "If the tongue is slightly farther back than optimal it vibrates against our soft palate, closes off our airway and we snore," Abeles says. The snoring doesn't cause the headache, he says, but it could be a sign the lower jaw is too far back. As a result, the muscles that support the jaw in an improper position produce the headache pain. Dr. Fred Abeles is known as one of the most sought after TMJ experts in the United States (www.FredAbeles.com). He's famous for getting results where all other have failed and getting those results without the use of surgery, needles or drugs. He is author of the new book "Break Away: The New Method for Treating Chronic Headaches, Migraines and TMJ Without Medication." Abeles is the Clinical Instructor and Regional Director for the Las Vegas Institute for Advanced Dental Studies – one of the most prestigious post-graduate teaching centers in the world today. Position the oven racks in the top third and center of the oven and preheat oven to 325 degrees F (160 deg C). Line 2 large rimmed baking sheets with parchment paper or silicone baking mats. In a medium bowl, whisk together flour, baking soda and salt. In a large bowl, beat sugar, butter and shortening with an electric mixer set on high speed until combined, about 1 minute. Beat in the egg, followed by the egg yolk and vanilla. Add peanut butter and mix well. With the mixer on low speed, mix in the flour mixture just until combined. Mix in chocolate chips. Roll dough into 30 walnut-sized balls. Arrange about 2 inches apart on the prepared baking sheets. Using a dinner fork, press an X into the top of each cookie, flattening it to about half its original thickness. Refrigerate the remaining dough balls on a plate while you bake the first batch. Bake, rotating the positions of the sheets from top to bottom and front to back halfway through baking, until the cookies are golden brown, 18 to 20 minutes. Let cool on the baking sheets for 5 minutes. Transfer to a wire cooling rack and cool completely. Repeat with the remaining dough balls, using cooled baking sheets. Notes: Consider using virgin (not hydrogenated) coconut oil, for taste and for its purported healthful properties. Likewise, a peanut butter without any additives but salt (e.g., Smucker's Natural) is a good bet. Speaking at a marriage conference recently, I asked the men in attendance to rate their marriage on a 1-10 scale, with 1 equaling "poor" and 10 equaling "excellent." Nearly all of the men rated their marriage as an 8-10, with one man blurting out, "It's a 10 if she rates it a 10. I'm happy as long as she is happy." Other men in the group laughed and heartily agreed. Asking the women to rate their marriages drew a much different response. Most of the women rated their marriages between a 2-4, with neither men nor women being surprised at these responses. So, which response is more accurate? Were their marriages really an 8-10 or 2-4? It is a trick question, really, because both answers have validity. Let's unpack the responses a bit. While certainly these responses are a stereotype, not meant to speak for everyone, there is much truth in the notion that as long as their wife is happy and content, many men are generally content. There is also truth in the generalization that men tend to rate their marital satisfaction higher than women. Why is that? Again, speaking generally, men tend to ignore problems in their marriage while women, being more relationally oriented, feel the various highs and lows of the relationship. Women tend to read books on relationship, watch television shows pertaining to relationships and seek counseling to improve those relationships. Sadly, I rarely receive phone calls from men asking for help until their wife has issued some kind of threat, or worse, has moved out and has threatened divorce. At those times men, universally, frantically cry out for help. To be fair, men are not oblivious to what is happening in their marriage. They care about their marriage and genuinely want a close, intimate relationship. However, they become lazy and focus on many other things than their marriage, including work, money and sports. What are some questions you can ask yourselves to determine the state of your marriage? Are we able to talk about problems in a respectful and collaborative manner? Are we able to effectively solve problems, offering forgiveness to each other? Do we enjoy each other, able to share physical, emotional and spiritual intimacy? Do we both feel cared about and respected by our mate? Do we keep our marriage a priority? How can couples find help before their relationship reaches a crisis? How can couples maintain a steady eye on their marriage so they can avert a crisis? How can men and women work together to ensure they are watchful so that they are not the victims of an addiction, affair, separation or divorce? Here are some ideas to consider. One, maintain communication about your marriage. I have said this often, and it bears repeating - any problem my mate has is of my concern. If she/ he isn't happy, you shouldn't be happy. We all must maintain vigilance over our marriage, maintaining communication with each other. Both should maintain active conversation about the state of their marriage. Two, keep problems in front of you. Marital problems magnify when they are ignored or denied. Problems kept in front of us can be dealt with, talked about and effectively managed. Healthy couples aren't afraid to sit confidently with each other to talk about problems and collaboratively seek solutions. As they solve problems they grow in their ability to solve problems in the future. Third, continue to work on problem areas. Problems are rarely settled once and for all. We are human and as such, we are in process. We will make mistakes. Healthy couples recognize this and assume they will be always be working on problems. That said, healthy couples also make progress on problems. Progress, not perfection. Fourth, seek help with stuck points. Most couples will find themselves grappling with problems that overwhelm them at times. Subsequently, they refuse to be prideful and they reach out for help. Scripture encourages supporting each other in times of difficulty: "Greater love has no man than this, that someone lay down his life for his friends" (John 15:13). Finally, make your marriage a priority. Marriages don't fail - individuals in marriages fail to make marriage a priority. While we are willing to give emphasis to our work, our homes and even our children, we need to also give an emphasis to our marriage. We must always remember that our marriage is fragile and can fail through neglect. Are you tending to your marriage? How is your marriage, really? Residents of Tel Nasri village in the Hassaka province got a most evil surprise on Easter Sunday. The Islamic State detonated a church in an Assyrian Christian village in northeastern Syria. 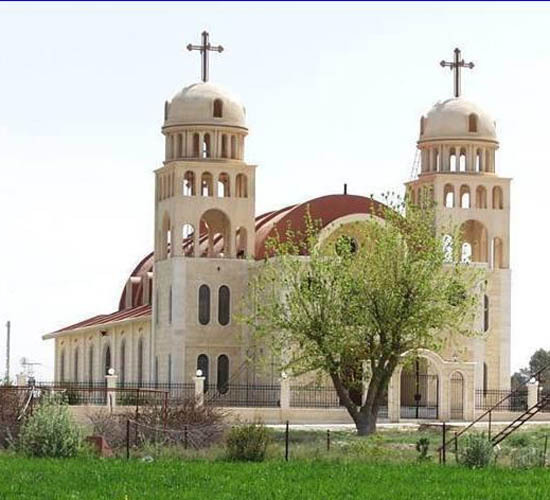 According to the Syrian news agency, residents of Tel Nasri village in the Hassaka province said that the Islamic State militants planted explosives in the Church of the Virgin Mary, an 80-year-old structure. The reports did not note if anyone was inside or if there were any casualties. Blown up on the day Christians around the world celebrate Easter Sunday, this included those who have fled their homes in Syria and Iraq. Those who are members of the Orthodox Christian church celebrated Palm Sunday. According to the Assyrian International News Agency, which covers the plight of Middle East Christians, the church was leveled after Assyrian and Kurdish fighters tried to reenter the village. Christian and Kurdish militias have been fighting the Islamic State group in Tel Nasri and other villages in the area. Built in 1934, the decimated church is one of three main churches in the village. Even the name of the town reflects its long connection to Christianity; Middle East analyst Raymond Ibrahim noted that Tel Nasri can be "loosely translated as 'Christian Hill.'" Islamic State militants have destroyed religious sites including churches, Shiite mosques and other shrines in the Syrian and Iraqi towns, which they have overrun. Pope Francis, in his Easter address prayed for an end to the persecution of Christians. Roman Catholic Cardinal Timothy Dolan and 'AD: The Bible Continues' miniseries producers Roma Downey and Mark Burnett have assembled a diverse group of mostly US church and ministry leaders to intensify their advocacy on behalf of the persecuted church in the Middle East. Dolan, Downey, and Burnett penned an op-ed piece calling for Christian leaders worldwide to pray and advocate for the Christian minorities in the Middle East, two months short of the June anniversary of the fall of Mosul, Iraq, where a large community of Christians was driven out violently. "Rarely since the first century has the church in the East faced persecution on this scale. Christian communities that took 2,000 years to build, and that were started by the apostles themselves, lie in ashes between the Tigris and the Euphrates," they wrote. "Whether they be Catholic, Orthodox or Protestant, Christian communities are united in what Pope Francis has called an 'ecumenism of blood,' recognizing that Christianity is experiencing more martyrdom today than in the first century." On June 10, Islamic State (IS) terrorists captured Mosul, Iraq's second largest city. About 500,000 people fled the city at the time. IS has ruled the city since then. By the end of July, 2014, IS had destroyed, damaged, or occupied all 45 churches, schools, and other institutions, according to AINA, the Assyrian news agency. On Easter Sunday, IS destroyed the Virgin Mary Church in Tel Nasri in Khabur, Syria, according to news reports. There are more than 80 signatories to the joint statement, released on Good Friday, including Nina Shea, Hudson Institute; Jo-Anne Lyon, Wesleyan Church; Jerry Falwell Jr., Liberty University; Wilfredo "Choco" de Jesus, New Life Covenant Church; Joel C. Hunter, Northland Church; Archbishop Vicken Aykazian, Armenian Orthodox Church; and Jim Daly, Focus on the Family. The leaders concluded, "This crisis escalated substantially last summer when ISIS swept like lightning through Iraq's Nineveh province, capturing the country's second-largest city, Mosul; a city that was until 2014 a home of a thriving Christian community, there centuries before Islam. ... now the inconceivable has happened: Iraq's Nineveh Plain has been emptied of its ancient Christianity community, which existed there for more than 1,500 years." In Rome, Pope Francis spoke out on Easter Monday that international political leaders should be doing more to resist IS and aid Middle East Christians. "I hope that the international community doesn't stand mute and inert before such unacceptable crimes, which constitute a worrisome erosion of the most elementary human rights. I truly hope that the international community doesn't look the other way." Earlier in 2015, a group of about 20 Christian groups created a 40-days-of-prayer website, called 21martyrs.com. The site features a two-minute video focused on the day IS beheaded 21 Christians from Egypt. The sponsors call on churches to play the video for members of their congregations, followed by a time of silence and prayers of reflection. IS killed the Christians on a beach in Libya, to worldwide outrage. Also, Downey and Burnett are working in partnership with the Institute on Global Engagement (IGE) through The Cradle Fund. This effort is designed to provide humanitarian relief to displaced Christians in the Middle East. So far, $1 million has been distributed for the rescue, restoration, and return of Christians to their homes and communities. During a recent conference call, Chris Seiple, head of IGE, spoke about his recent visits to the region. "We need a global strategy providing a positive vision, working with local leaders. We are still closing out World War I. That war is not over." He said the animosities between peoples in the region can be tied historically to political and governance issues, dating to World War I. The Ottoman empire, modern-day Turkey, ruled much of the region before World War I and was responsible for the genocide of Turkish Armenians. Seiple said, "What's the big picture? There is no clash of civilizations. There are violent extremists who are manipulating their religion to validate violence against innocent people from Nigeria to Central Asia." He said, "We need a Goldilocks solution here." Such a solution, he said would strike a balance between the Bush's administration's "boots on the ground" warfare and the Obama administration's inability to decide on a strategy and follow through. "Governance is a key issue. Arab governance--sacred, secular. socialist--all have failed." He said Arab peoples have a deep-rooted humiliation when they look at the golden age of Arab culture, generally dated from 786-1258. Seiple said more Arab leaders believe they should "stop blaming others and look in the mirror" when looking to solve their political and governance problems. Sunday, April 12, is the date the global Orthodox church will celebrate Easter Sunday, according to the Julian calendar. For the first time, perhaps in centuries, Iraqi and Syrian Christians, many of whom are Orthodox, will not celebrate Easter in their home churches, but rather in camps for refugees and displaced people.